Here is a set of humorous cat illustrations by a comic book artist. On each page is an image of a cat doing an improbably thing (painting picture, fighting the monsters under the bed, writing a book, bringing you flowers etc.). The beginning of each explanation begins with the word SMILE. 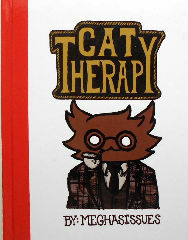 Cat therapy for people. Colored illustration on each page. The book is 5 3/4" wide x 8" high. Hardback, copyright 2014, approximately 78 pages (pages not numbered). Previously owned but in good condition.